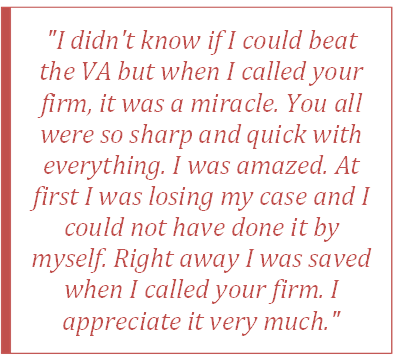 Helping veterans get the disability benefits they deserve is what our law firm does every day. We’ve helped hundreds of veterans get the benefits they are rightfully entitled to. We would like to share one veteran’s story with you. Our client was in the United States Army from 1974 to 1977 specializing in Firecrew-Mortar; in 1977 he was honorably discharged. Because of a series of traumatic events that occurred while our client was on active duty he developed a number of problems; anxiety, depression, flashbacks to name a few. Our client dreamed of being a career soldier but served only 3 years active duty. Before our client entered into the military he was known to be pleasant, outgoing and athletic, but when he returned something had changed. When he returned from the military he was irritable, jumpy and isolated him self from everyone. He no longer participated in family functions, played sports or attended neighborhood gatherings. Over the years his anxiety and depression worsened and he developed suicidal thoughts. He was unable to socialize or work around others, which hindered his ability to function in everyday life or hold down a job. Our client filed a disability claim for these disorders in 2007 and was granted a rating for his condition in 2013, more than 6 years later. When he received his rating of 30% he decided to file an appeal and that’s when we were able to step in and help this veteran. In our appeal we assisted with obtaining an increased rating for “acquired psychiatric condition” from 30% to 70% with an effective date of 2007. We were able to get our client 8 ½ years of back payment for this increased rating. He was also deemed unemployable at the 100% rating with an effective date in 2009. The overall award granted was over $220,000. No veteran should go it alone. It’s important that if you’re battling the VA that you have an experienced advocate by your side. Our firm has a strong military presence; with 4 of our attorneys being veterans, we understand what you’re going through and are dedicated to helping you every step of the way. If you need assistance appealing your veterans disability benefits claim, call us at 866-866-VETS or submit an online form for a free consultation.